Wild Goose Chase is a shop born of the love of unique and interesting decorative products for the person or home. Here you will find furniture, home decor items, paintings, jewelry, lamps, apparel, rugs and much, much more. Our offerings are fabulous and some of them are one of a kind items found only here. Patty Mais owner and operator of Wild Goose Chase has spent a lifetime in creative endeavors as well as in education. Born and raised in the Upper Peninsula of Michigan she began her zest for life with lots of great friends, fun experiences and love of being outdoors. She attended Michigan State University and Western Michigan University where she acquired a Bachelors and Master degrees in education. Education played a huge part in Patty's history but being an original multi-tasker, she always had a creative streak that kept driving her to try painting, pottery, flower making, wood carving and jewelry. With the support of an extremely talented and creative husband, she participated in hundreds of art shows and sold crafts through over thirty gift stores and galleries. Together they developed a passion for antiques and historical homes. They totally renovated two very old homes which sent them on a hunt for building materials and decorating items. Recognizing the need for quality home decor items lead to the establishment a home accessory store in Kalamazoo Michigan. That single store quickly grew to be four separate stores and they were decorating homes throughout Michigan and surrounding areas. Patty was then "juggling" teaching, running several storefronts and keeping several antique booths supplied as well as her favorite job of all....being a mother to her two beautiful children. 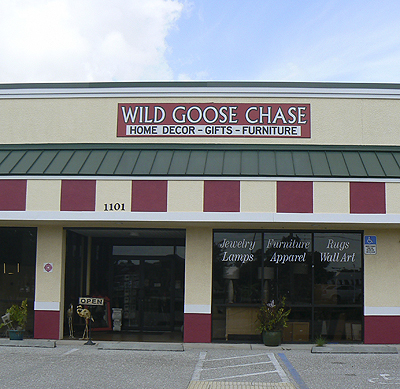 Finally, the couple decided to slow down, enjoy a warmer climate and spend quality time with Patty's aging parents so they moved to Florida.....but the creative side was still tugging at her so she opened a new store in Port Charlotte called "Wild Goose Chase". 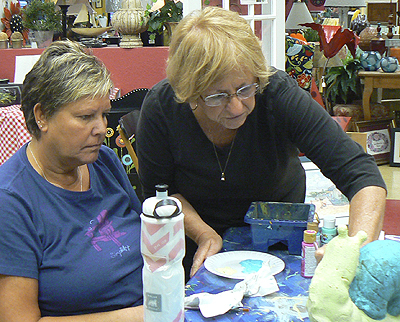 Now Patty can still dabble in painting, teach decorative furniture painting classes and continue to help people design creative home environments and, best of all, meet wonderful new friends.